For trusted commercial window installation and repair services in the Portland and Gresham OR area, look no further than All Service Glass. We are here to help take care of your needs with speed and precision. Fully licensed, bonded and insured, you will have peace of mind knowing that you are in the hands of credible commercial glaziers. The seasoned glaziers with All Service Glass have many years of industry experience as well as local customer service experience, making our commercial window installation services highly sought after in the greater Portland OR and Gresham area. Offering you competitive prices is a core commitment from All Service Glass, and this is made possible because of the close relationships that have been carefully cultivated with premier commercial window manufacturers. The look and quality of your commercial windows say a great deal about your company as they have the ability to project a professional and reputable image of your business. Broken or compromised commercial windows can give customers the impression that there may be other things that are neglected within the business as well. Use your commercial windows as an opportunity to present the best image possible to your customers. 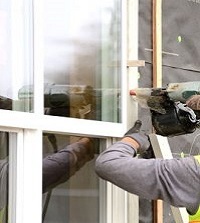 Our commercial window repair specialists are dedicated to quality, efficient and timely service. If you are in need of commercial window repair or replacement, contact All Service Glass today. You won’t be disappointed! No matter your commercial window repair needs, All Service Glass is here to serve you. Don’t let a broken window, or cracked glass take away from the image of your business. Contact All Service Glass today for more information or to schedule your free no obligation consultation.